Up to very recently visiting Myanmar (previously Burma) was something of a headache – now with e-visas and many more flights, that is no longer the case. 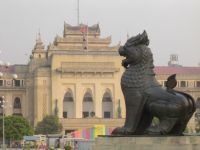 Luke King reports on what to expect in the former capital and still main commercial city, Yangon or Rangoon from the times of British Empire “The Garden City of the East”. Wherever your business in Burma, now Myanmar, you are almost certain to visit the steamy port city of Yangon (formerly Rangoon). It is a city teeming with life and, for the businessperson, opportunities abound. A local landmark is The Strand Hotel, which opened in 1901. Built by the Sarkies brothers (of Raffles in Singapore fame), it was once described as the finest hotel East of the Suez. Today, it is an all-suite property, offering all the conveniences one would expect. Butlers will bring complimentary tea and coffee at any time, and the lobby bar still attracts the expat community, especially for Happy Hour on Friday night. Although a close contest, we found The Savoy Hotel a superior choice, with its inviting pool (there is none at The Strand) and fabulous suites boasting teak furniture and local antiques. Much of the city is walkable – at least during the day when it is possible to spot the cracks in the pavements and the huge potholes! On foot you can explore the city's many crumbling colonial buildings. If you need a cab, short hops around town will cost just a few hundred kyat (pennies); to and from the airport US$10-15. There is no need to queue in the official taxi line when you arrive – just strike a deal with whoever accosts you as you leave the terminal, and prepare for a first taste of Yangon's legendary traffic (the 20km journey to town can easily take an hour). Dinner can be taken alfresco on the streets of Chinatown (19th or 21st St), where a whole fish, steamed and curried, is yours for less than £2. After dinner, and perhaps a few bottles of the local brew, treat yourself to an invigorating Thai massage on 19th St – you will pay just a few pounds and feel ready to tackle the hustle and bustle again. After dark, spectacular views of the famous, illuminated Shwedagon pagoda can be had on the roof of the aptly-named Vista bar on West Shwegondaing Rd. The cocktails are simply awful, but the view makes up for it. Once business is done, be sure to take the time to visit the ancient city of Bagan, where one can tour the remains of over 2,200 temples and pagodas. The experience of the domestic terminal will stay with you for some time! Myanmar is an extremely safe destination, with crime against foreigners almost unheard of. We found much of the online information about the country out of date. 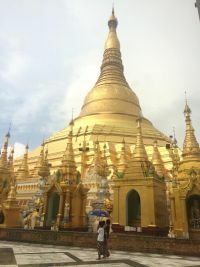 Our mobiles worked perfectly and wi-fi was prolific – a free connection could even be had inside the Shwedagon pagoda. There was no shortage of cash machines and it was easy to change dollars for kyats – either in official stores, or on the black market. We found the best rates at the airport, but the savings are negligible. One thing the Internet has right is that you should take note of the condition of your US$ bills – the locals are fussy and will demand clean, crisp notes. The hotels we used had UK-style, three-pin sockets. Obtaining a Myanmar visa is pain-free: UK nationals can apply online. The process was efficient, and our acceptance emails came within two days of applying, uploading a photo and paying the US$50 fee. However, there are no direct flights between the UK and Myanmar. We flew via Malaysia, first using British Airways and its recently re-launched service to Kuala Lumpur, then Malaysia Airlines for the 2.5hour hop between KL and Yangon. Holding discounted Economy tickets with Malaysian, we upgraded to Business Class using the carrier's MH upgrade programme. We paid around £40 extra per person per leg – and it was well worth it. Onboard we found large, comfortable leather seats with good recline, as well as tasty meals. The crew worked hard, frequently checking to see whether we needed another gin and tonic or glass of champagne. For us, a two-day stopover in Kuala Lumpur at the end of our trip did rather nicely. The historic Majestic Hotel is an excellent choice for the business traveller, offering easy access to the railway station as well as the major attractions of Malaysia's capital city. The hotel boasts heritage rooms in the original tower, live music in the evenings and a super afternoon tea. Sinking a few cocktails in The Smoke House was a pleasure. Other flights to Myanmar involve one-stop options with Qatar Airways, Singapore Airlines, Thai Airways or Vietnam Airlines.